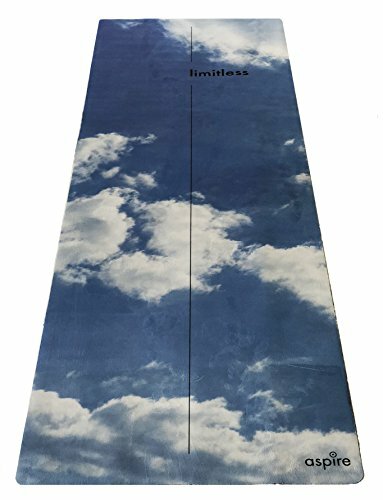 Our LIMITLESS Travel Mat is a 1mm non-slip mat that is extremely soft, durable, and absorbent, especially for hot yoga. No towel required! The limitless mat can be either folded for travel or rolled up using the mat strap, which is included, taking up minimal space. It is lightweight with two usable sides. One side is a super sticky rubber and the other side a micro suede that is sweat activated. Not sweaty right away? Simply spray the mat with a fine mist of water or use the rubber side. We use an eco-friendly material that is moisture resistant and antimicrobial. The LIMITLESS Mat has a simple, beautiful design with a centre line for ease of positioning in many asanas. Designed by dedicated yogis, our focus is on creating beautifully inspired yoga gear you will love using throughout your life-long yoga journey. Practice on with intention and resilience. Check out other products by ASPIRE YOGA GEAR on the web or on Amazon. If you have any questions about this product by Aspire Yoga Gear, contact us by completing and submitting the form below. If you are looking for a specif part number, please include it with your message.